As the Indomitable Lions of Cameroon gather in Yaounde ahead of their double-header against Gabon on the 5th and 9th of September, Somen A Tchoyi was the only one in the 22 Europe based players to score for his club this weekend. He thundered in a header to score the second goal for Red Bulls Salzburg that beat KSV Superfund 3-0 in the Austrian superleague. The Bulls are now topping the league in Austria. Samuel Eto'o played his most elaborate game in an Inter shirt (although he did not score) when the Italian champions destroyed their city rivals Milan 4-0. He gave width, depth and fluidity to Inter's game. He obtained a penalty when Gatusso fouled him in the 18 yard box which, Milito scored. Cameroon's Benoit Assou-Ekotto and Sébastien Bassong Sunday scored the two goals that helped Tottenham Hotspur beat Liverpool FC 2-1 in the last game of the opening day of play in the English premier league. Both men scored in the presence of the Indomitable Lions manager, Paul Le Guen, who was at White Hart Lane as a pundit for the French television channel Canal+. Generally a very controlled person, Le Guen's pride could be felt in his voice as he responded to the screams by the french commentator who reminded his viewers at every occasion that the two players were Cameroon internationals and Le Guen's is their manager. Cameroon's Benoit Assou-Ekotto and Sebastian Bassong Sunday scored the two goals that helped Tottenham Hotspur beat Liverpool FC 2-1 in the last game of the opening day of play in the English premier league. Assou-Ekotto shot spurs into the lead with a devastating left foot strike at the 43rd minute of the game. It was his first goal for his club since he moved from France. Cameroon's Minister of Sport and Physical Education has confirmed the appointment of Paul Le Guen as head coach of the country's football team. His statement also confirmed French media reports that Le Guen would come along with his assistant, and a physiotherapist. This sparked controversy as some local media and posters on online forums wondered why he should come with a crew and criticised government's decision not to name Cameroonians as his assistants. The following article, originally published in September 2007 in the Herald newspaper's column: Geof's Game Plan, is in favour of a big staff with clearly defined roles and picked by the head coach. Considered from that perspective, a staff of three (pending further appointments) is not even enough for the Lions! Cameroon may have to play their crucial World Cup qualifier against Gabon without their captain, Rigobert Song, after he sustained a serious shoulder injury in a friendly against Ivory Coast which, Cameroon lost 2-1. The charity game, in memory of the Ivorians who died in a stadium stampede last March, confirmed the Lion's inability to set-up offensive play, but the coaches will take comfort in Marcus Mokake's goal that broke a two match goal drought. That was the final score line. The Indomitable Lions became the first sub-Saharan African team to win a match at the FIFA World Cup. Being the tournament opener and against an Argentina side that included Diego Maradona, the world’s best footballer at the time, this caught the international media spotlight. FFootball had put Cameroon on the world map. I am going to miss an event I have dreamed of for the last 20something years of my existence! 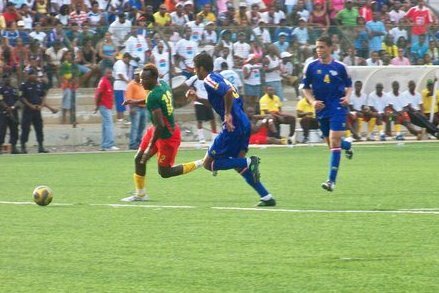 A Cameroonian football club playing the final of the African Champions League. The word legend which generally refers to a literary genre consisting of stories between myth and history, is also used in our every day conversation to describe someone with larger –than-life accomplishments whose fame is well-known. 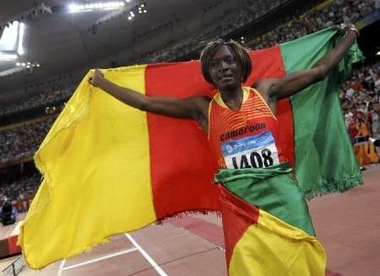 With back-to-back gold medal wins at the Olympics (2004 and 2008) Francoise Mbango Etone, has surely made it into that select club of Cameroonian legends. The story of the hurdles she skipped on the way to golden glory is an epitome of the unpredictability and paradox of Cameroonian sporting successes and failures. Cameroon’s hopes of repeating their gold winning exploit at the Olympic Games in China ended on 16 August 2008. The cub indomitable Lions were beaten 2-0 by Brazil. The South Americans were led by Ronaldinho who was aged 20 when Cameroon knocked Brazil out at the very quarter finals stage of the competition eight years ago in Sydney, Australia. Having followed the qualifiers to this competition and the All Africa Games in which the U-23 Lions won their third consecutive gold medal, I had hoped they would give us much more pleasure with their vibrant football. Instead of pulling out knives to finish-off this pack of cub lions (as I observed some commentators do on Cameroon TV channels); I propose a SWOT analysis of their performance. Traditional African wrestlers have been girding their loins for weeks, each having the ambition of emerging champion at the African Traditional Wrestling Championships hosted on 2 to 10 July 2008 by Senegal. A review of press articles on the event reveals that Senegal are the hot favourites with Niger, Mali, Togo, Ghana, Benin, Burkina Faso , Nigeria and Mauritania as the other participants. Painfully, Cameroon is absent from the list although there is a tradition of wrestling especially amongs the coastal ethnic groups and the Bakweris in particular.